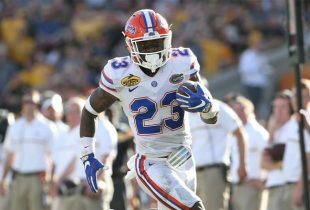 Each week following a Florida Gators game, ONLY GATORS Get Out Alive will grade the team position-by-position based on each unit’s performance. This week, we look at how the Gators fared against the South Carolina Gamecocks Saturday afternoon on the road in Columbia, SC. Grading Tim Tebow week-in and week-out has proven to be a difficult task. He was good for 199 yards passing and two touchdowns, including a deep bomb to wide receiver Riley Cooper and a record-breaking run. Tebow had Cooper open in the end zone on two other occasions; once he slightly overthrew the ball, but the second one have been caught by the receiver. On the ground, he averaged only 1.6 yards on 16 carries, the second consecutive game he has totaled less than two yards per carry on average. That is worrisome. I originally had Tebow graded a little lower but gave him a little boost for what could should have been. He still needs to get the ball out sooner, especially with the offensive line struggling in protection (two more sacks). Why does Emmanuel Moody continue to get single-digit carries each week? This game he received three which were turned into 35 yards and a touchdown on an 11.7 average. Jeff Demps and Chris Rainey were less impressive, averaging 3.6 and 4.6 yards respectively while gaining a combined 85 yards. Running backs need to get into a rhythm. Short dive plays (which are easily being schemed against) and limited attempts impede that from happening. Moody is adoubtful this week with an ankle injury. It seems to be one week on and then one week off for Cooper, who floundered last week after grabbing four balls for 78 yards and two touchdowns two games ago. Far from silent like he was last week, Cooper hauled in three receptions for 112 yards and a touchdown. However, as mentioned above, he had an opportunity for two mores scores and is partially to blame for missing one and completely to blame for dropping the other. Deonte Thompson didn’t even get on the box score while Brandon James had four receptions and Omarius Hines got his first major playing time of the year catching two for 20 yards. Need much more from this unit, though I will say Tebow had open receivers that he failed to hit all day long. A slow day for Aaron Hernandez, he was still able to contribute somewhat offensively. One of his three catches was for an important first down while the other two picked up major yardage when the Gators were pressed backward after penalties. There is no doubt that Gamecocks head coach Steve Spurrier set out to silence Hernandez. For the most part, he succeeded. Hernandez cannot be expected do it all every week. Freshman Xavier Nixon got the start at left tackle, shifting the offensive line a bit by moving Carl Johnson to left guard and Mike Pouncey to right guard. While Tebow is still experiencing a career-high in sacks and this unit is certainly to blame for that, he continues to hold on to the ball too long on some occasions. The South Carolina defensive line penetrated well this week, and there was a shift in the line, but there is no reason to make any excuses for this group. They are still not getting it done the way they are going to need to in two and three weeks. Hopefully this week serves as a way for them to gel before the bigger remaining games. Defensive end Jermaine Cunningham nailed down two important sacks, defensive tackle Jaye Howard contributed a menacing one of his own and then, of course, you have DT Justin Trattou. The man who, though his left biceps was torn weeks ago and still requires surgery, continues to play, intercepts a tipped pass and brings it back 53 yards. Clutch! Need I say more? Coming off consecutive weeks where the Gators linebackers dominated, one could say this was a bit of a down performance for the unit. However, it was still instrumental in shutting out the Gamecocks in the second half. Ryan Stamper contributed seven tackles and half of a sack while Brandon Spikes grabbed a fumble and was seemingly flying all over the field. Not their best performance as a unit, but very solid all around. South Carolina QB Stephen Garcia had his share of success early on against the Florida secondary, though in the end it was the immense pressure applied by the unit that caused him to have to run the ball 13 times and suffer six sacks, including 1.5 from safety Will Hill and another from cornerback Joe Haden. Haden earned a team-high 11 tackles, forced two fumbles and intercepted Garcia in the fourth quarter. CB Janoris Jenkins added to the party with a forced fumble of his own. Remember how last week I mentioned that kicker Caleb Sturgis would be playing in the NFL? Well, that is still a solid possibility, but he has strides to make on that goal after easily having the worst game of his young career on Saturday. It looked like Sturgis had turned a corner, but he only made one of four field goals on the night (32), missing from 52, 54 and 29. He also punched a key kickoff out of bounds, giving the Gamecocks good field position when they needed it the most. On twitter, before Sturgis’ third missed field goal, I told OGGOA readers that the kicking competition would be opened up and that Jonathan Phillips may be in next week. Plenty of backlash came. Then Sturgis missed his third in a row and kicked the ball out of bounds and everyone agreed with me – including head coach Urban Meyer who, after the game, echoed my sentiments. He was not pleased and should not have been. You cannot expect Sturgis to make every 50+ yard field goal, but he single-handedly left nine points on the board. Saving the grade for this unit are James, who finally made some strides in the the punt game (five returns for 85 yards), and punter Chas Henry, who nailed three for 127 yards – unbelievable. “F” for Sturgis, “A+” for Henry, “B+” for James. The most visible thing a coaching staff does is call plays during the game. Preparation, halftime adjustments and decisions on the fly remain behind the scenes (for the most part). Looking at Saturday’s game, I have to give the coaching staff credit for doing a good job all-around. Sure, there still appear to be some playcalling issues on offense. But Florida spread the ball around more than they have been recently. Meyer worked Hines into the game, and at least four or five (that I could tell) deep throws were called, three of which Tebow got off, one of which was caught for a touchdown and two of which had a good chance. Some may question Meyer’s decisions to kick two field goals from 50+ yards, but that just proves the confidence he has had in Sturgis. Defensively, coordinator Charlie Strong quite obviously got his unit fixed up at halftime. It was like a completely different defense in the second half – one that refused to be victimized and was out for blood after allowing two touchdowns in the first half. It looked like Spurrier was out-coaching Meyer early on. That did not last long. Solid job overall; the staff deserves plenty of recognition this week. The 10-point margin of victory may have some of you questioning this overall grade. Fact of the matter is: the only people who should care about margin of victory are gamblers who are betting on the spread. What I saw on Saturday was a defense that continues to dominate, an offense that is attempting to improve, 2/3 of a special teams that has looked as good as it has all season and a coaching staff that knows exactly what it takes to win each week. In other words, the Gators are as much of a “team” as you will find. Post-game comments prove just that. I also continue to be impressed that this group does not find being on the road to be a problem whatsoever. One could even argue that they thrive outside of Gainesville, FL. I would have graded the O-line lower than that. SC smoked them the entire game and if they don’t pull it together Bama is going to destroy Tebow.